We owe to the Greek historian Diogenes Laertius most of our information on the life and works of this philosopher, who, together with Socrates and Plato, symbolize Western philosophical inquiry. He was born in 384 B.C. in Stagira (Thrace) and died in Chalcis (Euboea) in 322 B.C. His father, Nicomachus, was physician to Amyntas, the father of Philip and king of Macedonia. On the death of Nicomachus, his relative Proxenus took charge of the young Aristotle until, at the age of 17, he moved to Athens to enter Plato’s Academy as a pupil, remaining there for twenty years until the death of his teacher in 347. It has been conjectured as to whether his departure was related to the fact that he was not elected as Plato’s successor to lead the philosophical school, or whether it was due to the war between the Macedonians and Athenians, begun in 359. The fact is that, together with Xenocrates, he moved to Assus and there married Pythias, the adopted daughter of the tyrant Hermeias, by whom he had a daughter, Pythias. It is worth underlining the fact that Hermeias, as well as being his father-in-law, could be described as a disciple of the philosopher, as shown by his last words when he fell into the hands of the Persians and was tortured: “Tell my friends and colleagues that I have not yielded or done anything unworthy of philosophy”. On the death of his wife Pythias, he lived with Herpyllis, by whom he had a son, Nicomachus, to whom he addressed a treatise on ethics. During his stay in Assus, he established a school with some fellow students from the Academy, including Theophrastus, who was to become his successor at the Lyceum. From there he moved to Mytilene, a city on the island of Lesbos, until Philip summoned him to the Macedonian court in 343 to undertake the education of his son Alexander, then thirteen years of age. At the age of forty-nine, in 335, Aristotle returned to Athens and founded a new center of learning, the Lyceum. However, the death of Alexander exacerbated the Athenians’ hatred of the Macedonians and he was threatened with a trial for impiety, so he was obliged to take refuge in Chalcis, where he died, aged sixty-two. Philosophical and scientific treatises, comprising the “Corpus Aristotelicum”, arranged by Andronicus of Rhodes into: Treatises on Logic; Physics; Biology; Metaphysics, or First Philosophy; Ethics; Politics; Rhetoric and Poetics. Logic is a mere Organon, that is to say, an instrument for gaining knowledge. Knowledge is apodictic, that is to say, demonstrative. Being is and cannot not be. The necessary being is the substantial. Substance is the being of being. It is on the one hand the essence of being and on the other the being of the essence. (Substance manifests the innermost aspect of Aristotelian thought and at the same time its most secret relation with Plato’s thought, which had made the good the principle of being). It is the substratum, that on which any other thing is predicated, but which cannot be predicated on the basis of anything else. As the essence of being substance is the logos, the concept, the principle of intelligibility of being itself. Substance cannot exist separately from that of which it is the substance. Substance cannot be compared with the Platonic idea, which Aristotle denies. Everything becomes something, which is the form or starting point of becoming, and comes into being from something, which is its potency, matter. “One should either philosophise or not philosophise; but in order to decide not to philosophise it is also always necessary to philosophise; thus, in any case, philosophizing is necessary”. At the beginning knowledge is moral wisdom or phronesis, but later he was to separate clearly the knowledge of the moral life, that is to say thought and action. Philosophical happiness corresponds to theoria, a type of life entirely devoted to the activity of the spirit. A distinction must be made between theoretical and theoric. The second meaning of Greek origin has nothing to do with philosophy and refers to processions. 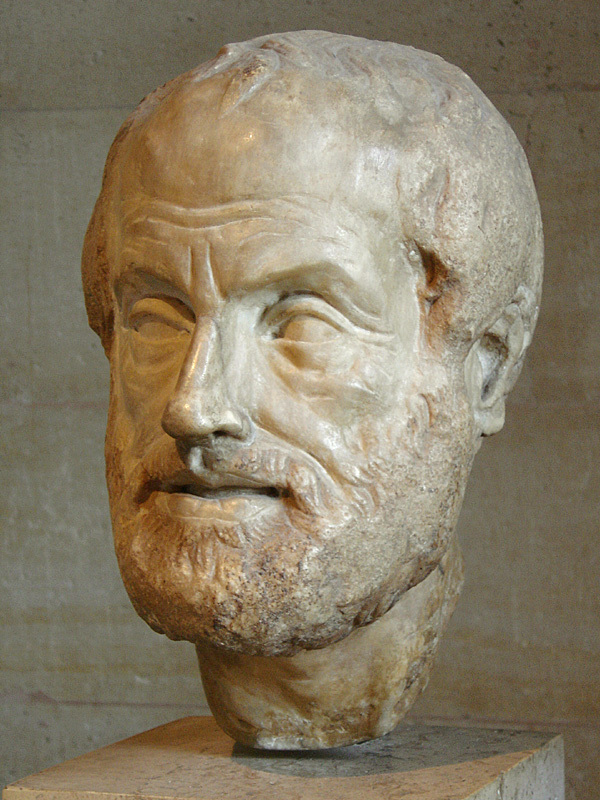 Aristotle uses the word theoretical to designate the type of knowledge whose object is to know for the sake of knowing rather than for any purpose outside itself; it also refers to the way of life, which consists in devoting oneself to that type of knowledge, that is to say intellectual virtue, to which moral virtue is subordinate. To be a man is in some way to go beyond the humanity in ourselves, since access to the contemplative life is beyond the human condition and man gains access to it “insofar as there is something of the divine in him”. Aristotle maintains this objective as a mere desire, but does not explain how to gain access to that condition. 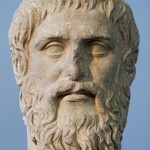 Aristotle’s main criticism of Plato refers particularly to the doctrine of the ideas and their separation from the sensible world. 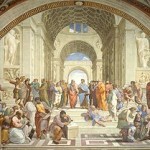 Plato’s excessive abstraction led Aristotle to deny the ideas. The importance of the sensible world: To know is to grasp the substance of things, the desire to know is manifested first by the pleasure of sensible perception, and from there the causes go back until reaching the first cause, of being qua being. Science is rational knowledge. Plato denied value to science or knowledge based upon opinion and the perception of sensible things. The duality of form-matter and potency-act (matter desires form): the substantial cause is the form, which is the thing in itself. The Aristotelian form appears to coincide with the Platonic idea, but they are different in that the form is not universal and is, moreover, immanent to the sensible world, while the Platonic idea is transcendent to the sensible world. The fact that the form is immanent to the sensible world implies that it cannot exist without the visible and concrete world, since Form and Matter are the same thing, the one in act and the other in potency. In Aristotle’s theory of knowledge thought and sensation remain inseparable, in such a way that sensation becomes the foundation of all knowledge. One only thinks through images and these are based on the sensations, therefore sensation and imagination are on the same plane. 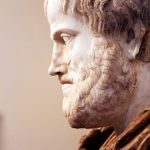 It is usually considered that Aristotle’s merit was to have restored the union between sensible world and ideas, but at the expense of the idea existing only when realized in matter. But it moves the rupture brought about by Parmenides and Plato between the intelligible world and the sensible world and places it in the sensible world by separating matter and form. Form is Nature and the Soul; Nature is the principle of movement, which leads beings towards their perfection. In the concept of Nature there is agreement between Aristotle and Plato, since both of them recognize the absolute principle of harmony and perfection, which leads all things towards an end and gives meaning to the Universe. God is thought. The first unmoving cause of universal movement, separated from the world. The God of Aristotle is thought which thinks itself, removed from the absolutely transcendent world. The human soul is inseparable from the body, while for Plato the soul is enclosed in the body as in a prison. Nevertheless, Aristotle distinguishes the soul in itself or Intellect or nous – pure thought – from the states common to the soul and body. 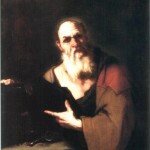 The intellect continues after death, a point on which he agrees with Plato, although he differs in not recognizing reincarnation. The passive intellect (tabula rasa – the blank slate), which receives the sensible forms, dies with the body, while the active intellect, which causes the intelligible forms to pass from potency to act, continues to exist, because of its immortal essence. But the Intellect is impersonal and is one for the entire human species. The immanency of Aristotle with regard to the knowledge of the soul only recognizes the transcendence of the intellect, but is unable to solve the problem of dualism. While for Plato philosophers have the duty to spend time in political life, for Aristotle philosophers should restrict themselves to teaching politicians, without any political commitment to leading others.